Sophie, our 14 year old nearly blind and nearly deaf heartdog, renders her plaintiff bark over and over until I finally take her out for the fourth time this morning! We head down the meadow toward the hillocks. 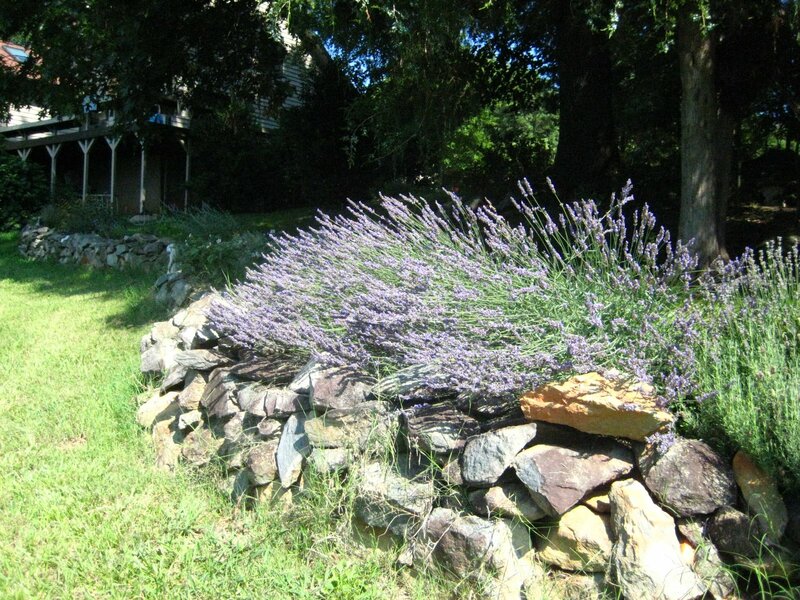 With curious caution we peer through the mother lavender plants to look for Footloose II, the 10 foot long black snake that suns on the dryrock wall, primed for any lizards or frogs that happen by. Breathing resumes as we only see dragonflies and bees drinking the calm lavenderade. I follow the path and Sophie swishes through the meadowgrass after plopping down and rolling in the freshly cut yardgrass. We meet further down the path and greet as if we’re just now ‘seeing’ long lost friends. Then off to the Fairie Hillock to look for any new signs of activity. This hillock is my ‘special baby’. I proudly peruse the dirt to look for any new signs of moss spreading to new places. It has so changed from when I first pulled the bramble of vines and raked the leavings from the trees to discover little magical patches of moss here and there. Where once there were a few patches, it has spread to form connecting mossmountain ranges that go from one end of the hillock to the other! I puzzle as to what has made it spread so. I know I did my part, but so did the natural world. Is it science or spirit or attention or the natural order of things? or the chaos of deer and animals stirring up the moss that is there and spreading it around? I guess I’ll never know about this or any other great creation of life! It’s such a mysterious menagerie! Was it my buttermilk and moss concoctions in the blender, my misting, my forever collecting of pieces of moss here and there to carefully add to the menagerie? There was all the sulfur I sprinkled to make the soil acidic, and my sporadic weeding of grass and other limblike invaders that tried to hide the beauty of the green cushiony blankets underneath. As I ponder and play with all these thoughts, Sophie goes straight for the half dug pond that has filled with leaves and muck from the umteeenth rainshower. She paws at the leaves, looking for something…either the mud underneath that she likes to chomp and chew or fresh water to cool her scorched tongue, or some toad to muse upon? Then off we go to check out the newly blooming thistles I’ve been eyeing further down the path. As we closen, a large deer startles the nearby grasses. I look for a little spotted one to scramble after her, yet none appears. 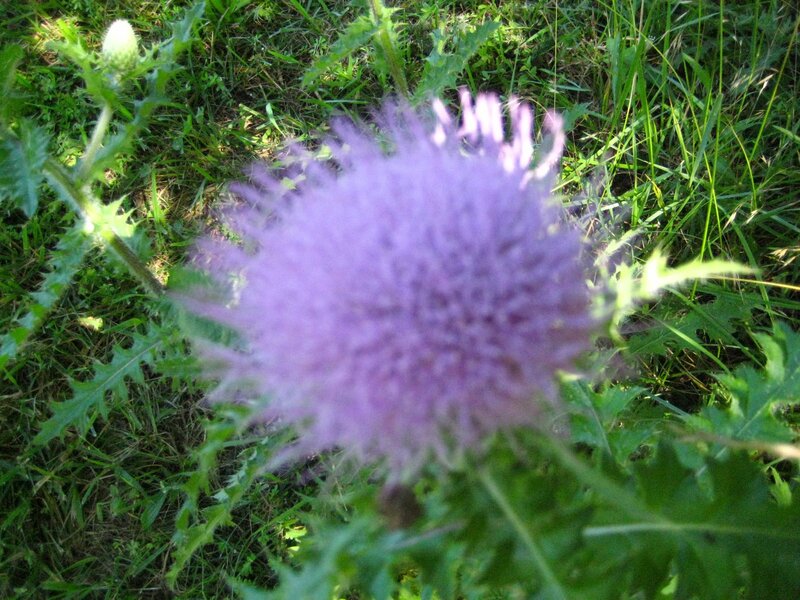 The thistle flowers are so purple! so brilliant! I don’t want to miss a single one! I’m so thrilled that we saved them from the crazy tractor woman who mows the meadowpaths! (that woman is me! creating paths in the meadow is another passion of mine.) There are a few ‘flower families’ throughout the meadow that need protecting from me, myself, and I, so they, myself, and others can enjoy them in their moments of brilliance. Further on we head for the bigger mucking pond in the woods. Sophie has discovered it with all her senses as she wades through the tall pondgrasses to enjoy the coolness of the shade and slimy water with all the other creatures. 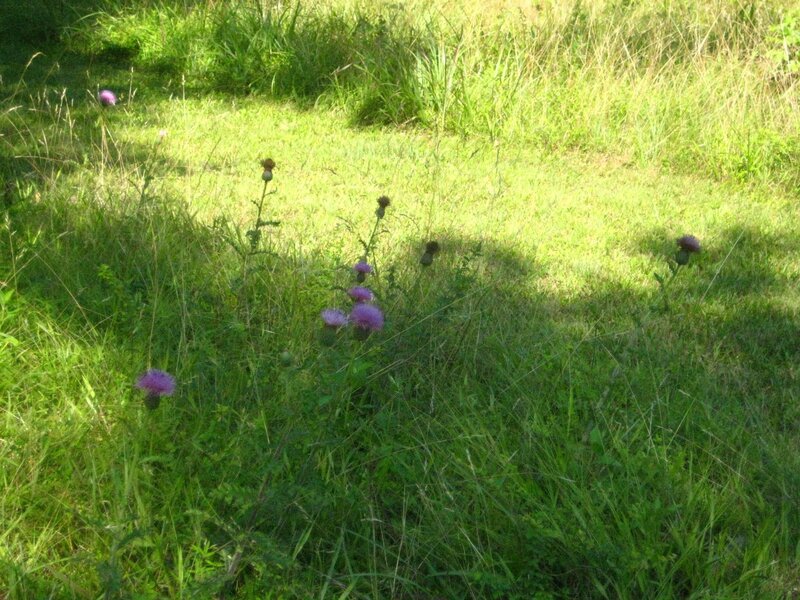 I leave her there as I explore the other family of thistles that are more on a lane than in a garden grouping. Even the round unopened buds are so full of possibility and beauty. I can’t help dreaming about pruning this limb, or clearing this little shady nook. I want to hold the beauty, the smells, the sounds, the pulse of it all in my breath and being forever. And I do! Hi, if you’re still there. This blog was of course to be a daily blog, yet in the beginning it is starting out g r a d u a l l y as a quartly blog. Moss grows slowly, yet it is a ‘forever’ sort of kind of matter. Today started with mowing paths through the meadow until the tractor sputtered to a halt by Hillock Number 2. This is a hillock with great potential and a character all its own that has not yet been discovered. As I walked the paths up towards the house, there was G. my beautiful friend, who was stooped over taking a photograph of the brilliant yellow flowers above the stone garden wall with the intense purple flowers behind it. She was preparing to teach her Color class out in our garden. I was thrilled to see her and showed her how the bumblebee cliffdwellers were doing with their ‘condo-construction’ under the cantilevered part of our house. I could spend hours with her, and as it usually turns out, I only have brief moments to soak her all in. What makes G so wonderful? Hmmm…she has such a positive buzzz or vibration about her. She loves life, loves beauty, loves kids, and looovves gardening! She’s helping me think in steps about how to make some of my million garden dreams come true. Sometimes I think my mind just mosses up into these beautiful visions of what’s possible, that then I have trouble “making it so” as my friend B says. (She’s a mutual friend of mine and of G’s.) See how even people moss together? Well, G understands that, and how dirt, plants, bees, people, dogs, all moss together, and thus she understands Me! And that is so grateful, isn’t it! To be understood by someone. She gets that my mind is very web-like (I mean like a spider’s web), and she just crawls right into it, delights along with me, and lives comfortably there. So even though I only have brief moments with her, they are precious gold. Then the ‘artists’ arrived. Four very alive women with sketchbooks in hand. We all met on the deck and G talked with us about ‘color’. Spectrums, light, intensity, …the words mossed around in my head. What really took hold for me was that light was what brought the colors to us. ‘On a Sacred Path.’ I took this quick photo of the cabins where we stayed, and my favorite stump, right as we were leaving for the airport. It was only months later, when a friend asked me if I ever saw any fairies. From that followed a great discussion about photographing special places and looking for ‘the unseen’. Here is the first ‘aha!’ I had. The sun’s out! Amazing what light does! Colors come out to play with it. Blue sky becomes the gameboard. Upon it, the steadfast family of evergreen peers from it’s hidden castle of mistyfog. Sillouettes slip off their meshes of blackened hose, and pull up nature’s herringboned hues. The wildwind has blown to darker lands leaving stillsilentspace for gratitude to grow. Gratitude is so great! All it needs is a teenytiny crevice to peek through and remind us of everything good! I think it grows more than exponentially! It grows beyond all directions and turns time back into what it iswasandwillalwaysbe! A sphere of oneness! And spheres? Well spheres need space and silence to hold them! And sometimes I guess since our minds think we can only access things we can see, we somehow need a little light on the subject to remind us what was there all along! Glad you decided to peek into my Blog and think about sharing in this Adventure with me! I LOVE Adventures! Maybe because it takes a little bit of boldness on my part to go on one! And there are so many wonderful surprises! This BLOG thing has been beckoning me for years now and I’ve just been hiding down in our mossy hillocks peeking at other blogadventures from behind big boulders that I’ve created in my mind. You probably know what I mean… the kind of boulders that build walls and look dangerous! Boulders like: ‘no one would want to spend time listening to my whispers!’ ‘I might goof and say something I didn’t mean’ ‘or be mis-interpreted’…. Besides, my personal boulders seem beautiful enough on my side…so there’s no ‘logical’ reason to dare venture beyond and see if they are as beautiful on the other side! And what if there is more than just one other side of things?!!! (which of course there is!). So here I’ve been down in my little ‘hillock’ writing books, nurturing nature and being nurtured by it, digging a pond, taking walks, and making fairy gardens and houses now and then. And meanwhile, living my life and learning to let it live me! I’ve gotten nudges near and far about ‘putting it out there!’ ideas, thoughts, etc. And so… here comes my bold whisperings to the world! Looking forward to listening for your whispers as well! Oh, and I guess I should mention a truth we all probably know already: the most exciting thing about adventures, especially mossy ones is that we have NO IDEA what shape they will take! So here’s to our Mossy Adventure!